This large private home built in 1880 served as Glebe’s cottage hospital for 74 years. Although it included operating theatres, the structure was retained virtually intact. Part of the ground floor was incorporated into the new Glebe Library, and the remainder of the building is used by a wide variety of community organisations for different events. Glebe Library also occupies part of Ben Ledi (named after a Scottish mountain that appears in Walter Scott’s poem, The Lady of the Lake), built as a private home but in 1915 acquired under the will of William Moore for the practice of homeopathy. This alternative form of medicine enjoyed great vogue from the Late Victorian era, when the British royal family, afflicted by the dreadful hereditary condition of haemophilia, the ‘bleeding disease’, sought cures conventional medicine could not supply. Queen Victoria, herself a carrier, passed the gene to her granddaughter Alexandra, who married the Russian Tsar, Nicholas II, and their only son was a bleeder. The consequent involvement of the faith-healer monk, Rasputin, was a factor in the eventual fall of the autocracy and the Revolution of October, 1917. With the advances of modern medicine, interest in homeopathy declined and the hospital was administered by the local area health board, who were required under Moore’s will to make a bed available for homeopathic treatment if required. Homeopathy continued to be taught at Great Ormond Street Hospital in London, and during the current revival of alternative medicine, at other places as well. 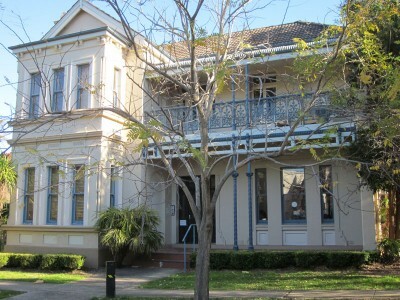 Sydney Homoeopathic Hospital (as it was spelt at the time) became effectively Glebe’s cottage hospital where local GPs could secure beds. The Hospital was closed by the Area Health Board in 1989, and a Homeopathy Clinic transferred to Balmain Hospital. The board recording the names of all the former matrons hangs in Glebe Library. A plan to turn Ben Ledi into a women’s prison attracted much resident opposition, and the site was acquired by Leichhardt Council for a new Glebe Library, established on the site in 1996. Turn to face the shops along the opposite side of Glebe Point Road.